It’s not every day that you hear someone saying, “The return on my social media strategy is outstanding!” In fact, new research from eMarketer shows that less than 20% of B2B marketers know for sure that their social media is generating positive results, and I’d guess the B2C data is similar. And according to The CMO Survey, 44% of marketers haven’t been able to show the impact of social at all, much less point to real ROI. Does this mean that social media isn’t making an impact? No (although social IS getting harder). But it does mean that marketers don’t have an effective way to measure the impact. Enter Samantha Ngo from Forrester Research and Jonny Bentwood from Edelman Intelligence, two smarties who are going to help solve this conundrum of what and how to measure social media effectiveness. 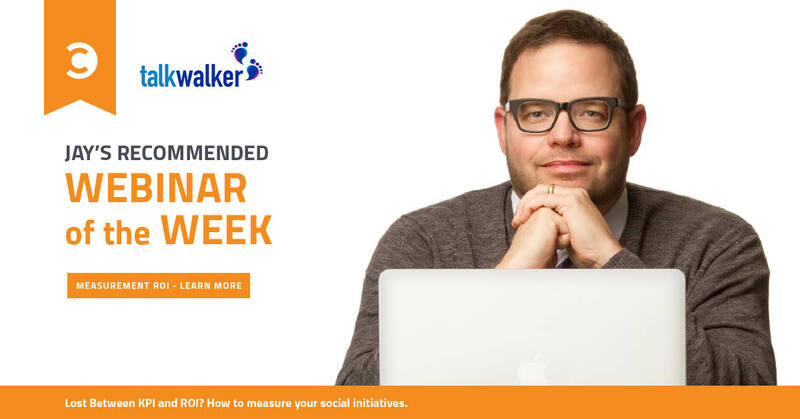 They’ll be joining Talkwalker on Thursday, March 16th at 8am PT/11am ET for a webinar that you do not want to miss! KPIs are personal. Every business wants to measure something different. This makes the question of what to measure a complicated one, but the process of determining which KPIs matter starts with understanding your business’s unique value proposition and defining your goals. Do you sell products or services? Are you trying to generate leads or sales? Awareness or loyalty? There are a million questions you need to ask yourself as you determine what the most important goals are to your brand and your growth. Spending the time looking inward at your overall business strategy will help you determine the right KPIs for your brand, but remember that these are not set in stone. Your KPIs may change over time. The trick is to figure out what they are so you can determine what metrics and data points you’ll need to look at to see the impact of social. I’ve written about this recently through the content marketing lens, but these ideas can easily be applied to social media. Unfortunately, every social media platform provides a different set of analytics. Some tools share demographic information, but not most engaged followers. Others show engagement, but not when and where. Plus, we don’t have a great way to see everything together without a significant amount of mining. This is a problem when we’re trying to measure and we often rely too much on tools, not human intelligence, to see how we’re doing. Shares, likes, and comments are great. They tell us that people enjoyed our content enough to do something about it. But where does it go from there? Are they actually taking an action? Buying something? Furthermore, when they do share, are their friends creating any impact on your bottom line? If you’ve got the warm fuzzies because someone gave you a compliment on social, pat yourself on the back and then dig deeper. But to measure actual revenue behavior, you have to get Web analytics involved. That’s not that difficult, but what if most of your purchases happen offline? Today, social gets very little credit in those scenarios, even though it may be driving purchases. Even if we can tie social media activity to business goals and KPIs, that doesn’t mean we understand what it means to our bottom line. We often forget that ROI is not just about return, it’s about investment as well. How many people do you have working on your social media team? What are their salaries? Those numbers compared against impact must be considered along with advertising costs, graphic design, social media software, and tools. In our consulting business, we find that companies routinely undervalue the true costs of social media. Social media is about people. And the amazing thing about it is that it helps us connect to more people than any other marketing tool. We can’t always measure the feeling that someone gets when they see our content, or when we respond to their question or retweet the photo they took at our store. But feelings matter. Listening to and really hearing what customers say about us matters. Don’t overlook the other numbers, such as sentiment and net promoter score. These will help you understand the full picture of how customers are interacting with your brand. Next week’s webinar will provide solutions to all of these common problems and more, so I encourage you to sign up and join the live event to have an opportunity to ask your burning questions or tune into the recorded version afterward. Your social media team and your boss will be glad you did!